(NaturalNews) Do you know what "meat glue" is, and whether or not you're eating it? That's what natural food activist group, the Alliance for Natural Health-USA (ANH-USA), is asking in a recent "action alert" sent to its members. In answer to the second part of that question, yes, it is very likely that the so-called premium cuts of meat you are buying at restaurants are really just cheaper cuts that are assembled using meat glue. If you needed another reason to stick only to grass-fed meat that is grown locally, the prevalence of meat glue in industrial meat should convince you once and for all. "Meat glue is an enzyme known as transglutaminase. 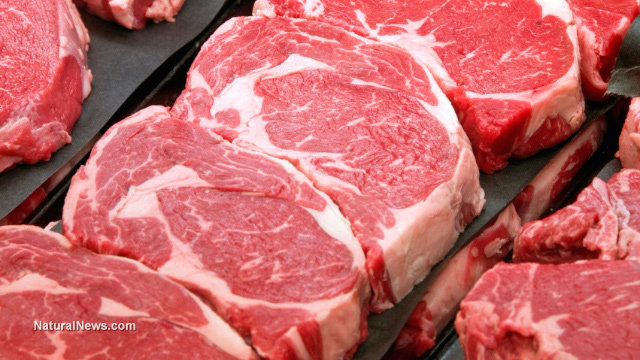 According to the report, many meat glues are created by cultivating bacteria. As shocking as it may sound, other meat glues are made from the blood plasma of pigs and cows, specifically the coagulant that makes blood clot. This 'special enzyme' is so toxic that people working with the product must use masks as to not breathe it in." ANH-USA notes that companies use this 'glue' to bind cheaper cuts of meat together with more expensive cuts, then refrigerate the cuts and slice them for cooking and serving. The company that makes the meat glue, Ajinomoto, even illustrates how the process works to sell imitations of high-end beef cuts like filet mignon, the group noted in its alert. Ajinomoto, as as we noted in December, was originally the name of the company that made MSG famous in the western world. Today, Ajinomoto has become almost synonymous with MSG. Products that utilize meat glue and are then sold to supermarkets, must be labeled as being "formed from pieces of whole muscle meat," or state that the cuts have been "reformed from a single cut." You'll notice that the language is more than a bit evasive, but then that is deliberate, says ANH-USA (which says it would call such deception a "lie"). But the Federal Trade Commission allows the practice to continue. "The larger problem, however, is in the restaurant industry, where consumers are almost never told their steak is being held together with glue. One meat company told reporters that gluing meat is common practice, and that most glued product by far is filet mignon destined for the food service industry," said ANH-USA. However, the deception isn't even the the worst part of all of this. Several food pathogens are harbored on the surface of meat and are usually killed off during the cooking process, even if the inside of the cut is rare. But in a glued steak, which consists of a number of different pieces of meat, pathogens on the surface of the various cuts can wind up inside the meat, which vastly increases the chances that a person could get sick from eating it. In addition to those concerns, there are others, ANH-USA advised. Dr. Aristo Vojdani has noted that patients may even have immune reactivity to meat glue. "Of 288 individuals tested, 9% reacted to meat without glue, but 28% reacted to meat with glue," noted ANH-USA. And, due to the fact that the body itself naturally makes various kinds of transglutaminase (transglutaminase-2, or TG2, resides in the skin, while TG6 is found throughout the central nervous system), eating meat glue has the potential to trigger an autoimmune disorder when the body's immune system attacks the transglutaminase that the body needs. "Like gluten, meat glue is a common ingredient in the American diet and could be causing inflammation for millions of people, which of course leads to other chronic health problems," ANH-USA warned in its alert.